All Vizio D-, E-, M-, and P-Series sets shipped since 2017 should be ready after a software update, Apple indicated, along with 2018 and 2019 P-Series Quantum models. Samsung is meanwhile promising support on 4-, 5-, 6-, 7-, 8-, and QLED-Series sets made in 2018 and 2019. Only 2019 models of LG's OLED, UHD UM7X, and NanoCell SM8X and SM9X TVs will have compatibility. Likewise, the first Sony sets will be this year's Z9G, A9G, X950G and X850G -- in the case of the X850G, versions 55 inches or bigger. 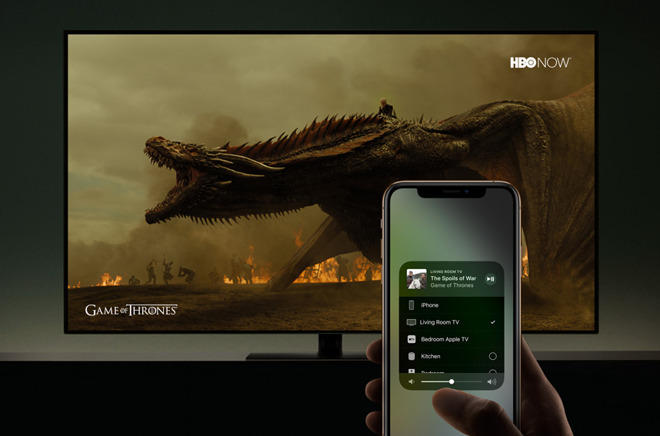 Samsung surprised the tech industry on Sunday by revealing it would be adding both AirPlay 2 and an iTunes app to TVs. Until this week third-party AirPlay 2 support was mostly constrained to speakers and receivers, and iTunes was limited to Apple devices and Windows PCs. Announcements from Vizio, LG, and Sony followed suit, though none of those mentioned a native iTunes app. AirPlay 2 will let people with Apple products push photos, video, and audio to TVs, including through Siri commands like "Play 'Blade Runner 2049' in the Living Room." It also means HomeKit integration for purposes like automation, and controlling some TV functions through the Apple Home app. Retailers, such as B&H Photo and Amazon.com, carry a variety of 2017 and 2018 models found on the list of televisions that will support AirPlay 2. Below is a sampling of buying options available right now. *B&H Photo will not collect sales tax on orders shipped outside these states. Does all these TVs announced with AirPlay2 undermine the market for AppleTV? Usually you can install a large number of applications (many Android based) on these TVs that mirror the most popular apps on ATV. With the addition of the ability to stream both video and audio from Apple devices to them, an ATV suddenly may seem like a product in search for a solution. To a certain extent, but many people will still want to upgrade older TVs, or improve their experience on recent ones. AirPlay is less convenient than picking up a Siri remote and whipping through apps. In reality, the vast majority of people buying new TVs would prefer to access the streaming apps and other features (AirPlay2) through the TV rather than an external device, regardless of the experience. Therefore, I wouldn't see this affecting Apple TV sales much at all. Long term, what you might see is an "Apple TV" built in to many TVs. This would be great for Apple as it would drive more people to the app store and it would eliminate any perceived need for Apple to get into the TV hardware business. Let the TV companies make TVs with built-in Apple TV functionality. This is what I was thinking as well.. My TCL 4k tv in the bedroom has Roku built in.. and I have been thinking for a while now how nice it would be if Apple did the same with TV Manufacturers! I personally don’t like smart TVs. I’d prefer a dumb tv and I’ll bring my own set top and/or receiver. If I ever get a “smart” tv, I’ll disable whatever I can and keep it off the network. I just don’t trust the software on these race to the bottom devices. I agree with you on that, but most folks probably would rather go for the most spec-ed TV, and then find less reason to fork out some more for an ATV. Clearly the answer is "yes." AppleTV became an increasingly mediocre, pointless product. Pretty much everything it does/did has been slowly, steadily competed away. Indeed, many competitors offerings give you much more (e.g., Roku with a $29.99 product that has an Xfinity app which allowed me to return the two additional cable boxes I had, thereby saving me $240/per year). It was only a matter of time that Apple woke up and smelled the roses. Such a wasted opportunity. (Siri might be headed in the same direction). Presumably this means that one should be able to use HomePods for normal tv viewing as opposed to just viewing Apple tv? Anyone know? "Citron Research took to Twitter today with a decisive message: “ROKU stock is uninvestable now”. Immediately after, the stock plunged nearly 10%. This comes after a tremendous 25% gain just 24 hours prior, when newly released strong Q4 streaming numbers boosted the stock drastically." "Now that Apple is expanding the capabilities and reach of the iTunes Store alongside previously exclusive features such as AirPlay 2 and Siri support, investors are seeing Roku at a dead-end financially "
I tend to agree. The deciding factor for me comes down to the question: "What is the expected service life of the primary product or appliance, e.g., TV, versus the expected service life of the add-on feature?" I always cringe when I see those $4000 refrigerators with the giant tablet built into them. My expectation is that the refrigerator itself should last about 10 years. The giant tablet, especially if it is Android based, is probably useful for about 4-5 years, at which point it becomes an outdated and useless appendage, or a giant door wart. This is not to say that built-in add-ons are never a good thing. If the add-on technology is stable, field upgradeable, from a well established and reliable vendor, and more cost effective when integrated it may be worth building it into the product. I follow a few cable cutter forums and we use both Vue and Sling in our extended family. Though the latter two are my prime interest, I can't help but notice the greatest number of complaints involve Roku anything. At least you're timely exiting Xfinity. They're headed for a price increase this year as their response to lost customers. About the dumbest tactic I can imagine. Yes, we have a couple generations of ATV in the compound - including the 4K. No need for any less secure copycats. Which BTW is why I don't recommend using, activating or allowing separate "smart" features of our TVs on our wifi networks. What store are you buying a TV from that still has salesmen/women that get commission? I don't understand either of these comments? How are all TV's with smart functionality "Race to the bottom devices" ? Not trusting the software and passing on that thinking to the actual TV hardware doesn't make sense? I have one of the last models of Panasonic plasma P50S60.. it has smart functionality (that I don't use ) and top NOTCH picture. This goes for the newer TCL P Series I have in my bedroom. It has Roku built in that I also don't use, but the picture quality is excellent.